Audible sells digital audiobooks, radio and TV programs, and audio versions of magazines and newspapers. Through its production arm, Audible Studios, Audible has also become the world’s largest producer of downloadable audiobooks. Users can use Audible.com to download audiobooks to your iPhone, Android, Windows Phone, Kindle or other listening device and listen to Audible audiobooks by best-selling authors anytime. Browse Audible’s selection or search for an audiobook that you’d like to purchase. Purchase the audiobook: If you’re not currently an Audible member: Select Start your free trial or Buy with 1-Click. 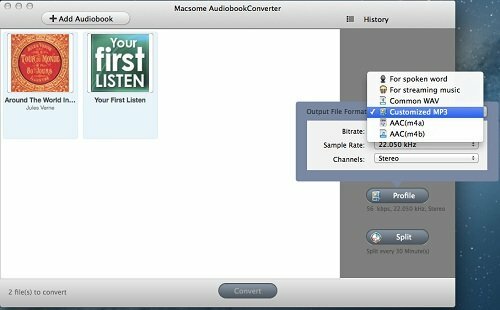 After the purchase, you can download the Audiobook on your computer, and now go to free download Macsome AudioBook Converter, Windows users click here . First of all, Install it on your computer. Step 1. 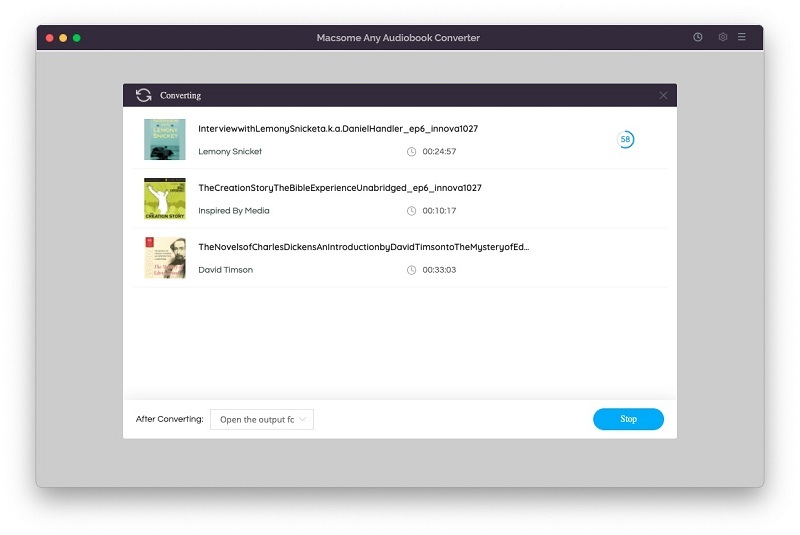 Run the Audiobook Converter. The Audio Book Converter loads all playable audiobooks from the iTunes Books library automatically. Please make sure that you have authorized the purchased Audiobooks to the device or the computer so that you can play them normally. Step 2. Click Profile button and select the required profile in Output File Format drop-down list. Step 3. 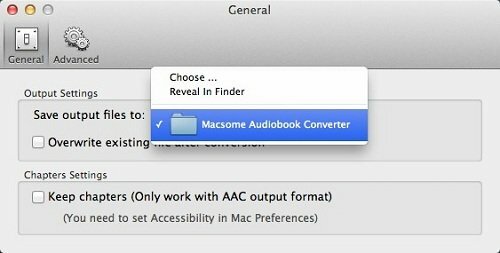 Click the Macsome AudioBook Converter menu and select Preferences to customize the Output Settings by clicking Choose… to set the destination. Step 4. Click the Convert button and then the selected files will be listed in the window that pops up. And the Status will keep updating the status of the files until that the conversion finished. After the conversion is done, you can play the purchased Audiobook on any MP3 player as you like without any limitations. Apple Music is all about streaming. You pay a flat fee to unlock access to Apple Music’s entire catalogue, but you don’t actually own the music you listen to. That is to say, in the whole month, Apple Music lets you save tracks to listen to offline, You won’t own those files and you won’t be able to offload them anywhere else. You can’t burn them onto a disc, use them in separate video projects, or put them on other devices. If you decide to cancel your Apple Music subscription, you’ll lose access to those songs. If you want to remove the DRM from Apple Music and then play these M4P music files without limitations any more, how to do? To solve the above problems well, Macsome iTunes Music Converter is helpful and useful, which uses high recording and encoding to MP3 / AAC technology to convert these DRM Music files to MP3 formats, and then you can enjoy these files on any MP3 player devices as you like. The revamped version of Apple Music will reportedly include an all-new interface that’s “more intuitive to use”. The company will also improve the integration between their music streaming and download services, and online radio features will be expanded. To those who closely follow or use Apple Music, it’s no surprise that the company wants to improve the service in the near future. Apple hasn’t really added any new functionality to Music since it launched last year, despite many criticizing it for a lack of features compared to other music streaming services like Spotify. Alongside a revamped Apple Music, Apple is expected to unveil new versions of Mac OS X and iOS at WWDC. There’s also a change we may see a new version of the MacBook Pro as well as the Apple Watch. And if you want to burn your Apple Music files to CD, the guide can help you. Apple’s much-criticized iTunes app came under fire again last week, after musician James Pinkstone claimed the software deleted 122GB of his own music. While Apple sent two engineers to Pinkstone to try and diagnose the problem, the company has also released an iTunes update that includes “additional safeguards” against music deletion. It’s not clear exactly what those safeguards are, but TechCrunch claims iTunes version 12.4 includes them. Apple acknowledged the music deletion issues last week, claiming the company had only seen the issue in an “extremely small number of cases,” and that it had been unable to reproduce the issue. The curious case of music deletion doesn’t appear to have been fully solved, but some speculate these “additional safeguards” might help protect iTunes users from accidentally deleting music from an iTunes Music Library. iTunes 12.4 also includes a “simpler design” that brings back the old left-hand navigation bar. We’ve reached out to Apple for an update on the iTunes music deletion issues, and we’ll update you accordingly. Mother’s Day is coming, except for sending wishes to your mother, would you like to play some music songs for Mother’s Day? There are plenty of ways to toast the women who gave us life on Mother’s Day, this Sunday. Raise a glass this Mother’s Day, and let these songs be your soundtrack. In this soft rock piano medley, the Backstreet Boys declare their love and appreciation for their mothers. With lyrics like “You showed me when I was young just how to grow,” Hallmark could learn a thing or two from these gentlemen. When the song debuted in 1999, fans and mothers everywhere swooned. ‘N Sync’s pop ballad “God Must Have Spent (A Little More Time On You)” could be written about any woman in the boys’ lives, but they dedicated it to their moms. The video features a mother and child, from birth to adulthood, growing and making memories while the boys croon in white suits. Christina Aguilera is celebrating her third Mother’s Day as a Mom with three-year-old Max, but this 2006 single addresses her own early childhood, as she thanks her mother for leaving her abusive father. Danzig’s 1991 breakthrough hit isn’t really about mothers, but like them, it rocks. Kanye West owes a lot to his mother Donda West, who retired from her job as an English professor to manage her son’s career. This performance, filmed before Donda passed away unexpectedly in 2007, is a testament to their close bond. This Rolling Stones classic seems harmless, but a deeper listen actually reveals that the title is a reference to prescription drugs used by lonely housewives. On this song from its classic 1971 album “The Wall,” Pink Floyd asks, “Mother, do you think they’ll like this song?” They certainly did. While we’re pretty sure Mama wouldn’t approve of violence or forgetting to take out the garbage, she’s bound to appreciate an LL classic that samples James Brown and Sly and the Family Stone. Recorded by the Jackson 5 in 1971, “Mama’s Pearl” was reportedly called “Guess Who’s Making Woopie (With Your Girlfriend)” until the lyrics and title were changed to fit 13-year-old Michael. A staple of any Mother’s Day playlist, this Boyz II Men ballad is about a family held together by a mother’s traditions. There are kinds of Mother’s Day music songs to play. And if you have Apple Music service, you can free download them and use Macsome iTunes Converter to convert all the downloaded Apple Music songs to MP3 format. First free download and Install Macsome iTunes Converter and run it. Second, click Add button and choose the Music library and add the files you want to convert (Mac Version). Third, click Macsome iTunes Converter Menu, and in the drop-down list, choose Preferences, turn to Advance to set the output format (Mac Version).. Finally, click Convert button to start converting these mother related songs to MP3 format..
After the conversion process is finished, you can share these MP3 music files with your Mom.